Varanasi is the oldest continually inhabited city in the world, with settlements dating back to 11th century. It is located in Uttar Pradesh state of North India. Situated on the banks of the holy Ganges River, the city is considered the spiritual and cultural capital of India. 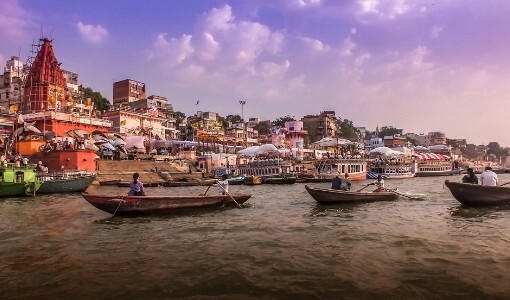 Varanasi is widely popular for its hundreds of ghats (embankments or steps on the river), where religious activities like cremations and daily ablutions take place in the holy Ganges. It is believed that Varanasi is named after the rivers of Varuna and Assi. Hindus believe that Lord Shiva founded the holy city over 3000 years ago. Since then, Varanasi has been the cultural and religious center for Hindus, Jains and Buddhists. 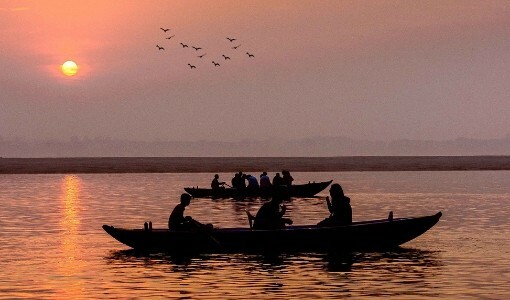 In the early mornings, you can take a calming boat ride on the Ganges River. It is also the most convenient way to get a sweeping image of the ghats of Varanasi. The best part is, you get to see the sunrise while on the boat. There are many ghats located along the Ganges River. Each ghat has its own religious significance. It is from these ghats that you witness people in take part in holy bathing and cremations. The best time to take a stroll along the ghats is in the early morning. Walking along the Ghats, you get a sense of the spiritual life at Varanasi. Of the may ghats, if you truly have to pick and choose, Dashashwamedh Ghat is where the Ganga Aarti takes place every evening. It is believed that Lord Brahma made the ghat to welcome Lord Shiva. Another famous ghat is Assi Ghat. Located on the southern end, it is an important ghat for Hindus as they bathe in the river before worshipping Lord Shiva. It is located 3 0 minutes away from Dashashwamedh Ghat. Known as the "burning ghat" Manikarnika Ghat is where cremations occur daily. Hindus believe that being cremated at Varanasi, they will attain salvation. Named after Goddess Lalita, the Lalita Ghat was built by King Rana Bahadur Shah of Nepal. The King built a Nepali Mandir, which is also known as Kathwala Mandir (Kath means wood, and the temple is so named after the materials used for its construction like stone, wood and terracotta). The temple is a replica of Kathmandu's Pashupatinath Temple. In the evening, you can make your way towards Dashashwamedh Ghat to experience the Ganga Aarti. The synchronized ritual is performed by priests swaying lighted brass lamps. The aarti lasts for 45 minutes and you can experience it from the ghat or from a boat on the river. Another well worth thing to do in Varanasi is visiting its many temples and ashrams. There are many to choose from. On the western bank of the River Ganges is the Kashi Vishwanath Temple. It is also called the Golden Temple because of its two ornate gold domes, that were offered by Punjab Kesari Maharaja Ranjeet Singh in 1839. The temple was constructed in 1780 by Maharani Ahilyabi Holkar, and is one of the twelve Joytirlingas. Another holy temple in Varanasi is Durga Temple, that is located in the Durga Kund (pond). The shikhara styled temple has a statue of Goddess Durga that many believe appeared in the temple on its own. Next to the Durga Temple is the Tulsi Manas Temple, which is dedicated to Lord Rama. The walls of the white marbled temple has text of Ramcharitramanas written by Tulsi Das. Many believe that the temple is where Tulsi Das wrote the famous epic. Varanasi is a vegetarians' delight as its cuisine mostly consists vegetarian offerings. The food in Varanasi is famous for its distinct flavors and cuisines. Start your day with a plate of Kachori Sabzi. The deep fried Kachoris are stuffed with a spicy mix of either lentils of potatoes and served with a flavorful curry. Another breakfast favorite is Safed Makhan Toast, which is locally made bread toasted over coal served and with butter. Chai or tea in Varanasi is very aromatic and served in Matka (earthen pots). Every corner you turn, you are sure to find street vendors or stalls that sell appetizing snacks like Channa Dahi Bada (spicy fried chickpeas served with yogurt) , Laiya Channa (boiled chickpeas mixed with masala, peanut, onions, tomatoes. etc), Chooda Matar (flattened rice or poha served with peas that is stir fried with spices),etc. For those who favor sweet delicacies, there are a variety of beverages and sweets to choose from. The beverages found are mostly milked or yogurt based. The refreshing Thandai is an aromatic milk and curd infusion. Varanasi also offers a variety of Lassi flavors, but each one of them is creamy and freshly made. There are alleys lined with sweet shops that sell the ubiquitous pipping hot jalebis, Laddu, Peda, Kalakand, etc. Once there, you should try the famous "Banarasi Paan. "Paan leaves are stuffed with betel nut, rose and baba chutney, coconut and you have to eat the whole paan to get the full aromatic dose and flavour of it. Paan is mostly eaten after lunch or dinner as it aids digestion and freshens the mouth. There are a variety of shops that sell Banarasi silk sarees. These hand-woven silk garments are an essential saree that every woman must have in their wardrobe. The silk sarees and silver and golden brocades are hand-woven masterpieces that can be worn! Varanasi also has exquisite jewelries, with sacred symbols and intricate metal works. These gems and trinkets will be unique pieces to be added to your accessories. The exquisiteness of handicrafts found at Varanasi also include stone carved toys and musical instruments like the sitar and tabla. 10 km north east of Varanasi is Sarnath. It is an important pilgrimage center for Buddhists as it was in Sarnath where Lord Buddha preached his first sermon in the Deer Park, that set in motion the "Wheel of Dharma." The Dhamekh Stupa at Sarnath marks the spot of his first sermon. The stupa stands tall at over 30 meters and has a diameter of over 28 meters. The lower portion of the stupa is engraved with beautifully carved stones and the upper portion has geometrical patterns. The stupa is believed to have been constructed by Asoka. Vindhyachal is another famous Hindu pilgrimage site located in Uttar Pradesh. It is located over 60 km from Varanasi, and is in the Mirzapur District. Like Varanasi, Vindhyachal is also located on the banks of the Ganges and devotees visit it for ablution. Vindhyachal is famed for its many temples, like the Ashtabhuja Temple, Goddess Vindhyavasini Temple, Kali Khoh Temple and Lord Rameshwar Mahadev Temple. There is also a pond, called Sita Kund, where Goddess Sita used to bathe. About 120 km away from Varanasi is Allahabad. 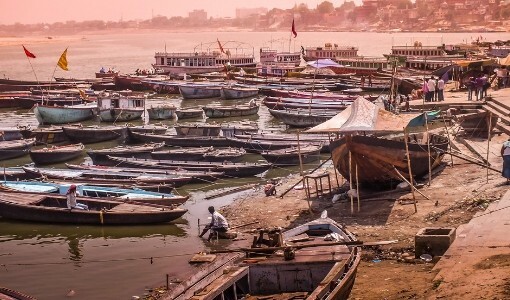 It is now officially known as Prayagraj since October 2018. It is situated on the confluences of three rivets, Ganges, Yamuna and Saraswati. One of world's biggest religious festival that is attended by millions of people, the Kumbh Mela is held at Prayagraj. Owing to the influence of Mughals and the British era, you will find a fusion of culture and architecture here. Places like All Saint's Cathedral, Akbar Fort, Anand Bhawan, Bade Hanuman ji Temple, Mankameshwar Temple are some of the best places to visit at Prayagraj. Located 190 km from Varanasi is Ayodhya. It is located on the banks of River Saryu and is the birthplace of Lord Ram. Ayodhya is an important spiritual center for different religions, especially for Hindus and Jains. As there are people of different faiths living together harmoniously, there is a spiritual aura you will experience here that is rare and unique. Some of the major attractions to visit at Ayodhya are the Chhoti Devkali Temple, Handuman Garhi, Kanak Bhawan, Tulsi Smarak Bhawan, etc. About 250 km from Varanasi is Bodhgaya, where Lord Buddha gained enlightenment while meditating under a Bodhi Tree 2500 years ago. It is located in Bihar district and is an important place of pilgrimage, especially for Buddhists. The architecturally beautiful Mahabodhi Temple stands tall at 170 feet and the base covers over 40 square feet. The temple is listed in the UNESCO World Heritage Site. On the western side of the temple is the Bodhi Tree, which is where Lord Buddha sat and attained enlightenment. The best way to experience Varanasi is to go for a cultural walking tour. From strolling along the ghats of Varanasi, to visiting its many temples. The cultural tour will also have boating on the Ganges River, which is best done in the morning to experience the sunrise. It is not all about temple and ghats at Varanasi. There are also many museums that hold significant art, culture and history of Varanasi. The Bharat Kala Museum, established in 1920 houses a huge collection of paintings, Hindu and Buddhist scriptures, costumes and textiles. It is located inside on the premises of Banaras Hindu University. Located less than 10 km away from Varanasi, the Ramnagar Fort Museum was built in 1750. It is also known as Saraswati Bhawan. On display in the museum are art works, weapons and decorated howdahs. The Government Museum along Mathura Road offers an interesting display of antiquities from the 3rd to 12th century. It was established in 1874 and also houses excavations of the Mathura region. As a center of spirituality Varanasi is one of the best places for a yoga and meditation retreat. There is a strong sense of calm and peacefulness among the hustle and bustle of the city. There are many reputed yoga schools around Varanasi. From beginning to expert classes, you can pick and choose the yoga class that suits you best. As Varanasi is a site of religious and cultural importance, you will find an amalgamation of people from different religions and background. People from different faiths like Hindus, Buddhists and Jains are prominent here. The tradition, architecture and culture are closely associated with these religions. Varanasi also has its own unique art and culture. Famous literary personalities like Tulsi Das, Ravidas, Harishchandra, etc are from Varanasi. People here fluently speak Hindi and some speak English. Major festivals celebrated here are Makar Sankranti, Maha Shivaratri, Deepawali, Holi, Ram Lila, Dhrupad Mela, etc. 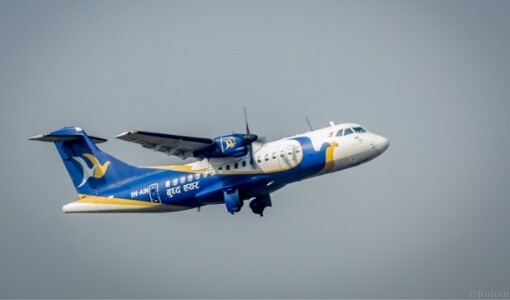 Buddha Air operates two weekly flights from Kathmandu to Varanasi every Monday and Friday. The duration of the flight between Kathmandu and Varanasi is about 50 minutes long. The flight takes off in the evening from the international terminal of Tribhuvan International Airport in Kathmandu. The ambiance and atmosphere you feel at Varanasi cannot be replicated anywhere in the world. Every alley around Varanasi is filled with history and culture. The old architecture of its buildings and temples add to its unique charm.